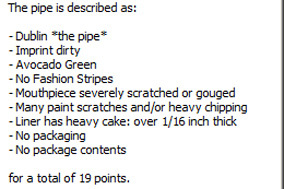 The value of pipe #793 is 19 points. Jim Arra saw a notice in The Pipe Collector that I was missing a few pipes, including a Forest Green Dublin. He thought he had one and, because it is in such bad condition, gave it to me. Sadly, it turned out to be another Avocado Green pipe. So it is offered for sale "as is." Dr. Michael Stokes decided to give it a try with some new tobaccos. I hope he likes it.